This is one cool watch. I have always like the Royal Oak series of watches from Audemars Piguet. I like the clean simple look of the Royal Oak and the Royal Oak chronograph because I like the tri-compax layout of the chronograph sub-dial. So when AP released the Offshore, I was very happy. A more robust Royal Oak. Sadly, I did not like the layout of the chronograph sub-dial. 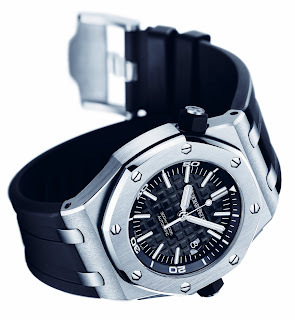 This year however, AP has released the Royal Oak Offshore Diver, reference: 15703ST.OO.A002CA.01. This watch is, to me personally, very nice. 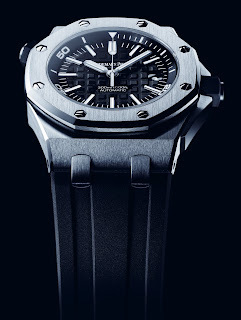 Finally a 'true' diver watch from AP. The unique aspect of the watch is that the overall design of the watch has not changed. The bezel to show dive time has been moved and placed inside the watch. This inner bezel is operated by the crown at the 10 o'clock position. This crown has to be unscrewed before it can be used. 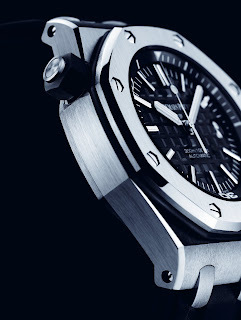 I like the fact that AP has decided to maintain the overall design of the Royal Oak true to the original. AP could have gone with the 'super compressor' design adopted by JLC, Longines and IWC but did not. Time to start saving. The case is still stainless steel. It measures 42 mm in diameter and is 13.75 mm thick. It's water resistance rating is now 30 ATM. AP has made changes to the gaskets, thickness of the case back and the front crystal to ensure the watch is guaranteed to be water resistant to 30 ATM. In addition to the increased water resistant rating, the watch is also design to meet the standards for anti-magnetic, shock and thermal variation resistance. The other interesting aspect of this watch is the dial and hands of the watch. The Swiss dive watch 92-11 norm requires the watch to be readable in the dark from a distance of 25 cm/ 10 inches. The watch achieves this with the faceted luminescent hour marker and hands. In fact if you look closely, the hour hand actually have 3 luminescent bars as opposed to the standard one. Even the sweep second hand is luminescent. This is important as it indicates that the watch is still working. The design of the dial further accentuates the readability of the watch. The dial has the black 'Mega Tapisserie' motif. This looks like the hob-nail dial design. The date window is at the 3 o'clock position. AP has chosen the Manufacture Audemars Piguet automatic winding calibre 3120 movement to power the watch. It is good that AP has decided to do away with unnecessary complications and only offer the date complication. This movement offers a 60 hour power reserve, quick-set date display, hacking second and beats at 21,600 A/h. This movement is hand assembled in AP facilities in Le Brassus. The watch will come with a rubber strap. Even the strap has been redone by AP and now offers the ability to withstand forces up to 200 N. This has been achieved by redesigning and resizing the pin buckle. Even the studs and the rubber strap have been reworked to guarantee a secure hold.